Tales from the Week Day Home: Crochet Workshop Result! A few weeks ago I went to an Intermediate (note, not "beginner" any more!!) Crochet class at Paperarts. We learned basic flowers then advanced to ....this! It's a bit of a ta dahhhh moment because having taken ages to make the loooooong scalloped row I didn't pick up the last critical bit about how to pull it all together and had to go back for a quick 10 minute remedial lesson to make - well what is it? 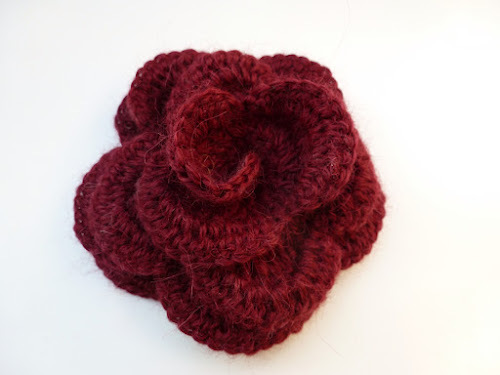 A corsage or a humongous flower? Whatever it is, I'm very pleased with it because it's the cleverest thing I think I've made so far. Just don't ask me how I did it or make another one! Then, flipping through a crochet book I found a simple pattern for a hexagon which had been made into a snazzy looking blanket. 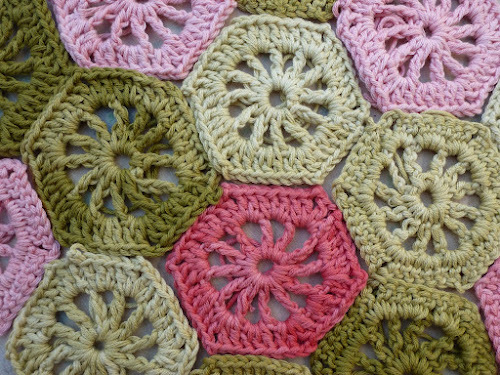 I have a plan to liven up the living room of the Week Day Home using a palette of colours based on rose and green so thought the hexagons would make a nice throw. Having made a few to put together to see how it looks, I'm not sure this doesn't look a bit too grannyish. What do you thInk?